P.S. 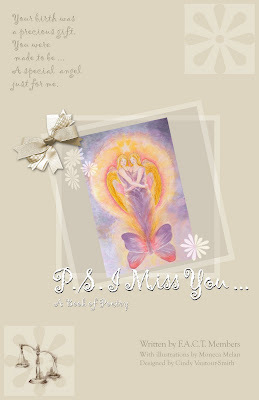 I Miss You... is now available. This book was completely written by F.A.C.T. members and their families & friends. The cover artwork & all the illustrations have been created by Moneca Melan. We would also like to thank Kathleen Mortenson for writing the introduction to our book. All of us at F.A.C.T. would also like to especially thank the woman who helped us make this book become a reality. None of this would have been possible without the kindness of Cindy Vautour-Smith, who dedicated many hours to designing and creating the finished product. All proceeds from P.S. I Miss You... go directly to supporting F.A.C.T. in its initiatives to create change within Canada's Justice System through awareness campaigns, media interviews & educational programs and to pay for printing of the book. We want to thank everyone who contributed to this book. To see this book come together from start to finish has been an amazing journey for me. It has helped me to heal in ways I can not even begin to express. I hope that all of you will purchase one for yourselves, and be sure to have your friends, families and co-workers purchase one as well. The book has been made to fit in your pocket book, and will hold a few pages in the back for your thoughts. For those of you who would like to be the first to purchase your copy of P.S. I Miss You... please find the order form attached to this email. Please allow a few weeks for shipping, as I will wait until I have a few orders before shipping the books off. We look forward to hearing from all of you!! Please also find a picture of the book included.